I?m a shoe girl and I just love shoes of all styles.? ?Fact is…I just haven?t had the means?to splurge on a great pair of shoes lately.? With the way?the economy has been going, I had to cut back on?my shoe allowance which is why I was?excited? to? ?discover shoe clips byAbsolutely Audrey.?? I was never?into wearing shoe clips but with this?option, I can?put good use to the shoes I already have….and save some money in the process. 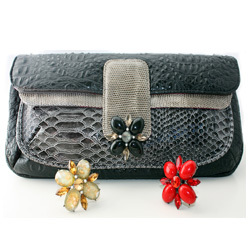 ?With shoe clips by Absolutely Audrey?you can add glamour to your wardrobe with fashionable and high quality shoe clips. And, they are not only for shoes.? You can clip them on?handbags, hats, and scarves to?get an instant makeover!? The options are countless. Check out these before and after photos to give you some ideas and inspiration of what you can do with an pair of shoes in your closet that are just waiting for a make-over. 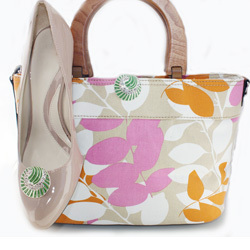 You can choose from a wide variety of styles and designs. Everything from bows, buckles, flowers and more.? There are even designs made out of pearls, rhinestones, crystals and enamels. ?? ?You can literally transform? a pair of ordinary flats or heels ?into something?fashionable. Would you like to win your own pair of shoe clips?? Absolutley Audrey has generously offered to provide one of my readers with a pair ofTwiggy shoe clips from her 2010 Spring Collection. Visit Absolutley Audrey.comand tell me another pair of clips you would like to have.?? This step is required to qualify for the drawing. Be sure to leave your email address in at least one of your comments so that I may notify you in the event?you are the lucky winner! Please leave a separate comment for all that you do to ensure you get all possible entries! Remember to include your email address on your comment! Contest ends,? Mar?15, 2010 at?12:00 noon CST. Winner will be chosen via Random.org. Winner has 48 hours to respond to my notification email, or a new winner will be chosen in their place. Disclosure: I was not provided with?any shoe clips from Absolute Audrey.? Shoe clips were provided for the purpose of?this giveaway and?no other compensation received.? The stated opinions are my own and I was not influenced in any way. I like the Katerina shoe clips, they are so cute. I love the Katarina shoe clips. Thanks for the chance. Love the Amelia shoe clips! 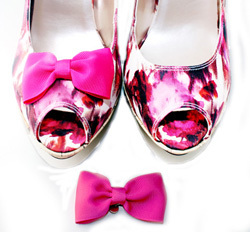 I would love the Camellia shoe clips!! Thanks so much! I’d love to have the Lily Shoe clips! I like the black Sophia clips the best. I follow Absolute Audry on twitter @Aerated. I would like to have Jackie shoe clips-Pearl. I love the Calista (pink) shoe clips! I like the Grace shoe clips.